Azure Entertainment can provide performances or entertainment for your next event! Whether it’s a festival, wedding, corporate show or function, hens night, concert, birthday, party, nightclub or any kind of special event, we can tailor a performance to meet your needs! We have a range of performers, entertainers and instructors available, ranging from Dancers, Singers, Actors, MC’s, Burlesque Artists, Fire Performers, Roaming Entertainers, Circus Performers, Contortionist, Comedians, Musicians, Bands, Hostesses etc; and can tailor our performances to suit any theme or timeframe. At your request, we can provide short, single performances or full-length pre-choreographed shows. Contact us now to find out more about our spectacular, extravagantly-costumed, fully-choreographed Song & Dance shows! Unsure of what type of entertainment you are after? Why not try something a little different? Have a browse through our unique Shows and Hens Night & Party Entertainment Packages below to give yourself an idea of just how extravagant and special your next event or function can really be with Azure Entertainment! 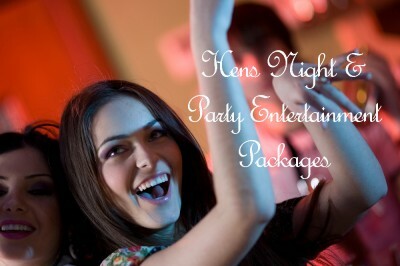 Our Premium Hens Night and Party Entertainment Packages are a fun and unique way to entertain you and your guests. With a number of fun and exciting themes to choose from, you’re bound to find one that suits the occasion! Click “HERE”or below for more details! Having such a diverse range of performers and entertainers means that we can put together a large variety of shows in an endless amount of themes for our clients. All our shows are extravagant, professional and can be tailored to suit any timeframe, theme or function.